Cardravious Crump said his Halloween party “went great. No problems, no nothing.” It was roughly an hour after the business student’s party ended that he and his mother discovered two people in the kitchen without invitation — uniformed Tate County, Miss., sheriff’s deputies, who said something about underage drinking. “Well then, I can talk to you,” said Carla Echols. “But can you step outside?” They wouldn’t, so Echols tried again: “You’re going to get the [expletive] out of my house ’cause I did not tell you to come in here.” Her son started to record the incident on his phone, but the officers ordered him repeatedly to stop. Crump wouldn’t — as the sheriff confirmed, citizens generally have the right to record officers at work — but when a deputy reached for something and the 20-year-old African-American man couldn’t see what, he yielded. What the deputy, whose name was left out of a news story, was reaching for were his handcuffs, but he didn’t arrest anyone. (AC/WREG Memphis) …Two people in this story were dressed as law enforcement. Another two tried to uphold the law. “You can’t record me. You can’t record me. You trying to go to jail?” demanded an officer from the Gary, Ind., Police Dept. Edward M. Strauss, 36, stood his ground. “Well, I can,” he told the officer. “This is a public street and, by the way, you’re live on YouTube right now.” Strauss was arrested, charged with disorderly conduct and resisting law enforcement. “You know what? You just violated my rights!” Strauss said as he was being handcuffed. He didn’t file a complaint about the officers, but the department opened an internal affairs investigation after seeing the video: recording a police officer on the job from a public place is not illegal, Chief Richard Allen confirmed, adding “We do not condone the violation of any rights given to citizens.” Even though the officer clearly knew the device Strauss was holding was a phone, and he was recording her, police filed an affidavit saying they found his “black and metallic looking object” that “may have been a weapon” was “suspicious,” and the charges have not been dropped. He is scheduled for trial next month. (RC/Northwest Indiana Times) …Citizens know recording the police is not illegal. The chief knows it too. Why don’t the officers? The second story (written by me: “RC”) was actually held for a bit to wait for the results of Gary P.D.’s internal investigation, which was noted to be in progress when this story first came out in the Northwest Indiana Times on October 6. An update in the paper yesterday (October 27) had no news on the results of the investigation, so when the Crump story came up later (written by contributor Alexander Cohen: “AC”), I decided to run them together. And she feels that way even though she recently found out an interaction she had with a citizen had been recorded without her knowledge. That’s reasonable too: she’s a government official. And certainly, the police feel they should be able to record citizens to gather evidence of wrongdoing, yet they object to the public looking back? Illinois, Indiana and Wisconsin, had struck down an Illinois law prohibiting people from making recordings of police officers in May 2012. There are many other such federal cases affirming the right, as well as many cases such as those reported above of officers harassing citizens for exercising that right. When “the man” with a badge and a gun trespasses and deny citizens’ rights there, inside the citizen’s own home, something is definitely very wrong. And I say this as a former sheriff’s deputy. What it really comes down to is what Los Angeles police officer turned novelist Joseph Wambaugh wrote about in The Blue Knight in 1972: “contempt of cop.” They can’t come up with a valid reason to order citizens away from a public place, so when they don’t give them a “yes sir!” and move on, the cop gets mad. They distract themselves, turning their back on what they say is important business to get into someone’s face, and make arrests that they know will not stand up in court. Arrest is the least of it. Sometimes that unnecessary use of force ends up turning contempt of cop into a capital offense, when the officer shoots someone in anger because some damned citizen actually wanted to exercise his or her rights. If the female officer was so concerned that the device he was “recording me” with was possibly a weapon, why is she shielding her eyes from that “weapon”? It’s obvious she felt no safety threat from it whatever, because she clearly knew it was a phone, not a weapon. In my opinion, that means the affidavit officers filed in court borders on perjury. Good for him, but when are we going to see the results of that investigation? And when are we going to see courts slapping down police departments hard for continually doing this? Man Arrested For Recording Police Awarded $275,000 — 2017, New Hampshire, in favor of a man who was arrested — again in his own home — for recording the officers searching the house because his roommate was suspected of selling drugs. That article also notes a $57,500 settlement in 2014, also in New Hampshire, in favor of a woman who dared to record the officer when she was stopped for an alleged traffic violation. Appeals court backs First Amendment right to criticize police — 2017, Minnesota), where a federal court not only upheld Brian Hoyland’s right to film police on the street in front of his house (from 30-40 feet away, from his doorway), but that officers were not immune from being sued for false arrest. Fall River man arrested for filming police officer awarded $72,500 — 2016, Massachusetts. The officer in this case used the charge that the recording constituted a violation of “wiretap” laws — a common tactic. Illinois Woman Arrested for Recording Cop Accepts $117,500 Settlement — 2015, Illinois. This one was especially ridiculous: the cop asserted that the woman was recording him without her permission — the law he was relying on for that demand had been declared unconstitutional years before — while the scene was being filmed by a news crew, who went unimpeded by the police. And that’s just a few results from a quick search. There are clearly many, many, many more. What’s the real problem here? Taxpayers are on the hook again and again for these settlements. 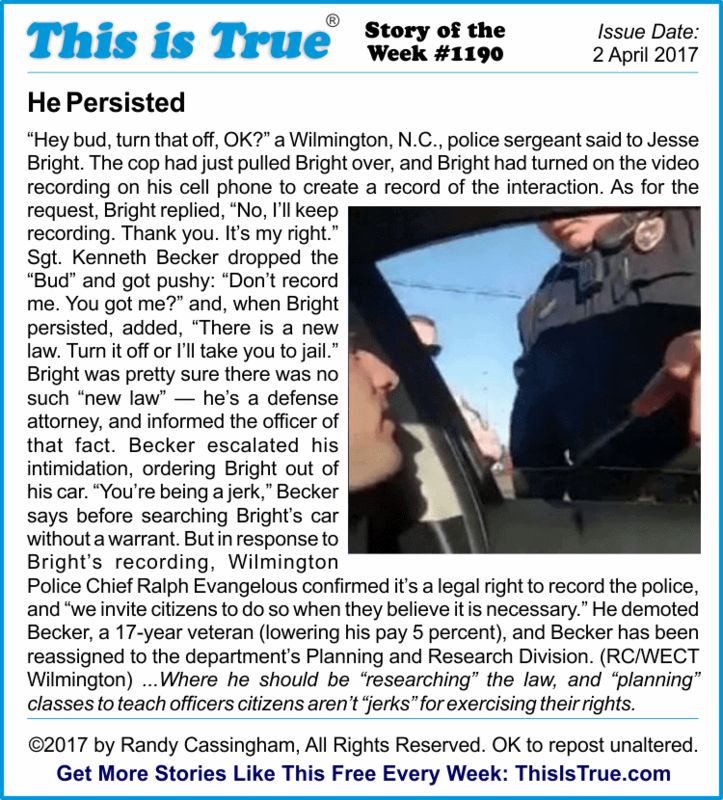 It’s time for criminal charges against officers who violate citizens’ rights when they know it’s not illegal for citizens to record them (says, again, the former sheriff’s deputy!) Especially when they make up bogus claims in court filings in an attempt to justify their unprofessional — and illegal — actions. 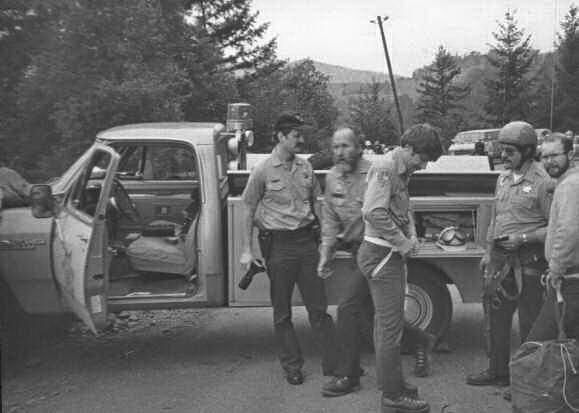 Me (center, holding camera) on the job as a deputy sheriff in the early 1980s, on a body recovery below us, down a cliff. Citizen recording (and, indeed, officers’ bodycams!) will record one of two things: the officers being professional and courteous, or being unprofessional and perhaps violating the law while supposedly trying to enforce the law. Objecting to such filming is tantamount to admitting they expect the latter to be revealed, rather than the former. Absolutely, the citizens need to stay out of the way and not interfere with police operations, but when that’s not a factor, buck up, boys and girls: it’s part of the job. I’ll update this page when the Gary police release the results of their internal investigation. I agree that police should be held accountable for their actions, I also believe that people have the right to record those interactions. I just wish that there was some way to de-escalate tensions between officers and citizens. In my opinion the hostilities are brought about by the attention people give to only one side of police stories. I think that the whole concept that officers are rampantly deciding what is lawful and what is not without regard of the law is just inciting trouble. To make the people whose job it is to protect you out to be the villain seems a good way to cause those people to decide you are the enemy. With the coverage of officers behaving badly on the rise I have to remind myself that there are many more officers doing their job right, than are doing it wrong. The fact that it is being covered heavily means we are seeing the same story multiple times in different ways leaving us with the impression that more is happening than it truly is. That said I firmly believe that we need new standards of training officers, and citizens need to remember that these officers deserve respect first. I have to disagree that respect must be earned, respect is something we should give. The only time we have to earn respect is when we have lost it. Every officer deserves respect first, only when they prove to be untrustworthy (as in these 2 stories) should we look to protect ourselves from our protectors. Spend any time on Photography is Not a Crime and you’ll see dozens, scores, hundreds of bad cops out there. Sure, there are sometimes settlements. But who pays those? Taxpayers do, not bad cops. It’s nice to see law enforcement (and former) cross the thin blue line. Thank you. There are good cops and there are organized criminals in uniform. The latter follow the rule of omerta, and try to get the good cops to join them in their crimes by talking about thin blue lines and how you never ‘betray’ a fellow cop. What they never say is that the bad cop betrays the good cop every day, by making that good cop an accomplice to everything the bad cop does wrong. Title 18, Section 242 of the US Code makes it a federal crime to violate or infringe any statutory, civil or constitutional right(s) under color of law. Federal law also considers any crime involving violence or the threat thereof to be an armed crime if the perpetrator is in possession of a firearm, even if the victim never sees the gun during the crime. Since police are almost never unarmed when on duty, this means that a 242 violation by a cop is almost always a felony. But the FBI is too busy trolling mental hospitals for DIY terrorists to enforce the rest of the laws they’re supposed to be enforcing, so few cops are ever prosecuted for this even when we don’t have a Cop Apologist in Chief in the White House. In 49 out of 50 states (North Carolina being the odd state out), if you witness a felony being committed in front of you, state law (common, case or statutory varies by state) allows you to make a citizen’s arrest that may (again, varying by state) have every bit of the force of law behind it that a police arrest does when it comes to resisting it, fleeing from it or staging a jailbreak from it. There is also a federal law that allows any person authorized by state law to make arrests for state law violations to also make arrests for violations of federal law. An arrest happens when you become aware of it, most commonly by hearing the words “I am arresting you for Thing.” The arrest is complete at that point, being cuffed & stuffed is optional. A video camera catching those words will cause immeasurable problems for an officer who ignores them, flees from the arresting citizen or worse, shoots that citizen claiming self defense against the arrest. To the best of my knowledge, no one has EVER tried arresting cops as a standard tactic. Since it’s possible to make such an arrest with mere words and no physical threat, it doesn’t put you in any more danger than already being there with a camera (or just the mark one eyeball) recording things. If we could get enough people doing it, just the bureaucratic overhead and paperwork to vacate the arrest will negatively incentivize them to behave better. Nobody likes more paperwork. North Carolina doesn’t allow one to make a citizen’s arrest? In that case, Deputy Fife had every right to be aggrieved by Gomer’s attempted citizen’s arrest. Several years ago I was pulled over. The officer informed me that his body cam was running and recording video and audio. I responded by telling him my dash cam was running and recording video and audio as well. He said “oh you have a dash cam? Ok.” and continued the traffic stop. That’s how it’s supposed to go. Settlements don’t do much I believe because it doesn’t directly penalized the offender. The demotion case was better but I wonder if the guy didn’t actually get cushy desk job out of it that would pay more than the old after a couple of review periods. My comment is very specifically about this bit in the second story: “…any rights given to citizens,” with the unspoken assumption that rights are given to citizens by the government or the Constitution. There are NO rights “given” to citizens by government. From the Declaration of Independence: “…endowed BY THEIR CREATOR with certain unalienable Rights…” (emphasis added). Our rights are a gift of God Himself and therefore pre-date, transcend, and supersede the Constitution or ANY document written by men (collective noun, meaning mankind, don’t make a stink about gender inclusive terms please). If a government, or a government document, “gives” us rights, then another government or document can take those rights away. It is absolutely crucial that we understand that all rights come from God. Catherine in Massachusetts argues that all of our rights come from God and predate any Constitution or laws of man. I would observe that the problem I have with her view is that “God’s Laws” are always a handy tool to use by scoundrels who want to justify anything they do. For example, Kim Wotzerface, the Kentucky clerk, who refused to issue marriage licenses to homosexuals — said that unworthy, “Oh, that’s a violation of ‘God’s Law'”. No, it wasn’t. But her actions WERE a violation of state and federal laws — laws which she swore to faithfully carry out. It is man-made government — government established by the consent of the governed rather than the consent of God — that secures our rights. A government of laws — laws that are clearly written for anyone to read, laws that are subject to argument in court — rather than one subject to the claims of religious “leaders” whose claims of what God said are untestable. America’s strength rests on her system of laws, not on someone’s say-so. Fortunately, I have very few contacts with policing officials, I obey the law (well, except for my lead foot, at times), and have no need to have that contact. I also live in a very rural area, which helps me. That said, I offer some tips. If you have a camera on your cell phone, turn it on. If you know how to stream it to social media, do that too. Be polite and non-abusive. YOU don’t like it when someone else calls you a ****** or a ******, why do you think a cop does? If you are physically handicapped and have difficulty entering or exiting your vehicle, inform the officer of that. Personally, I am too large and tall to retrieve my wallet if pulled over, and I tell the officer that and ask that they step to their Right (toward the rear of my vehicle) so that they remain situationally aware and remain safe in case I have something in my hand with which to attack them, That little bit of courtesy pays amazing dividends. Finally, especially if you are a minority, when stopped and you have the flashers on and the stereo off and the window partly down, pull your keys from the ignition and put the key ring over your little finger. In a Defensive Driving Course, an African-American Man said to do this, “to prevent a ‘Driviin While Black’ incident.” The retired cop giving that class really did think it might be a prettty good idea. I would also commend the ACLU Mobile Justice app that is available for many states. 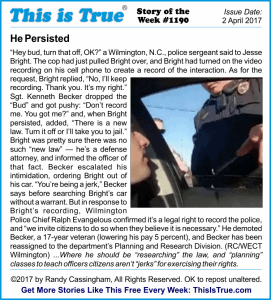 It automatically streams video to an ACLU server as it is recorded, ensuring police cannot illegally seize or destroy the recording. It also has an option to lock the screen when recording starts to guard against your phone being seized and the recording disabled or your phone being subjected to an illegal search. And if you are so inclined you can be notified when someone is using the app nearby so you can go and independently witness and record the incident. Yeah, about Rights. God-given (actually, Creator-given, most of the Founders were Theists, but not at all religious) and GUARANTEED by governments, who are specifically tasked with protecting & defending them through our laws. Thanks for giving me a chance to insist & persist. This does not BORDER on perjury; the evidence in the video PROVES it is perjury. I have great respect for the police, and I am inclined to permit them some allowance making honest mistakes in the heat of the moment. But the statement in the affidavit was not made under stress of difficult circumstances; it is a bold-faced lie made presumably in the calm and comfort of a police station or legal office. Every citizen should be very disturbed to see this evil under the cover of law enforcement. At the very least the police in question need to retract their “mis-statement”, be suspended without pay for a period of time during which additional training would be required before reinstatement. And because “the charges have not been dropped”, someone higher up needs to lose their job. This was nearly 25 years ago. A neighbour who very frequently had people *arrive* for parties at 3 am threatened to kill me when I politely asked them to keep the noise down. I had a small tape recorder and got the threats on tape. I called the cops. They talked to him first and found out his live-in girlfriend was the daughter of a senior officer in the department. The cops then came upstairs and warned me not to make false accusations — before they heard my side of the story. I said I had the threats on tape and he said it was illegal to tape people. I had the recorder in my hand, so I flipped the microcassette over and started recording. I asked the cop to repeat what he’d just said and he did. I told him I’d just recorded him. He said I broke the law. I said he should arrest me if that was true. He swore at me and left. His partner looked very embarrassed and like she wished she was anywhere else than there. I heard him tell the girlfriend downstairs not to worry about it as he left. The next morning, I went to see the police chief and played him the tape. I said I had other copies and that if nothing serious happened to the cop that day, I’d play the tape for the news media. The cop was suspended for a month and was then transferred to a desk job. R.C, sadly bad cops are world-wide as some of the happenings in my home country of Australia have shown (see below links). The only difference is the topics they are in trouble for, though ‘Filming’ is also a big issue there. I know quite a few cops (aus and us) who I would report ANYTHING to as they are amazing and wonderful people, and I was brought up to treat the police with respect. But these happenings are scary. Disabled pensioner tackled in own yard.